Digital breast tomosynthesis combines the advantages of digital mammography and 3D breast imaging. To facilitate the comparison of new tomosynthesis images with previous mammographic exams of the same woman, there is a need for a method to register a mammogram with tomo-synthetic images of the same breast; this is the focus of our paper. 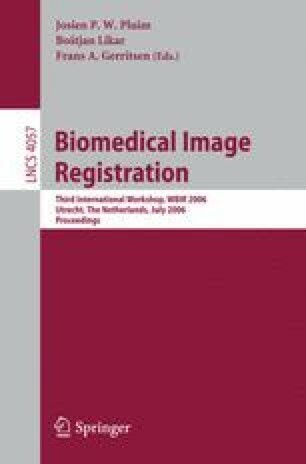 We have chosen to approach this multimodality registration problem by registering a mammogram with individual tomosynthesis source projection images. In this paper, we analyzed the results of registering an MLO mammogram to nine tomosynthesis source projection images of the same breast. On average, we were able to compensate 90 percent of the per-pixel intensity differences that existed between the two images before registration.